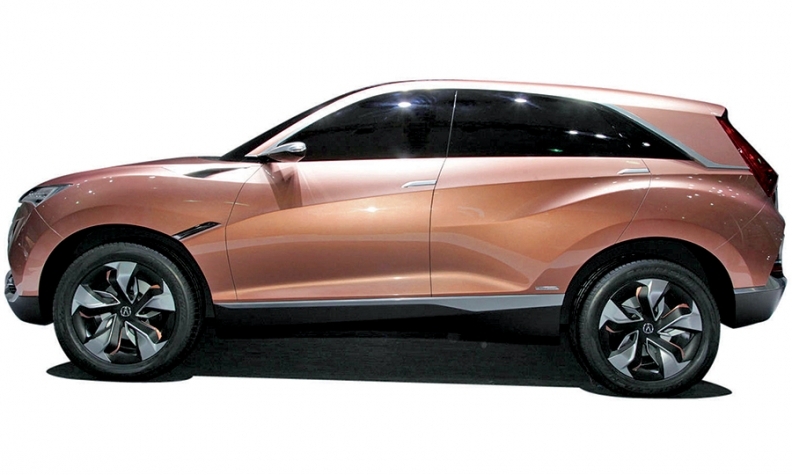 The Acura SUV-X concept at the 2013 Shanhai auto show could preview the new CDX. Next year will see Acura's long-awaited NSX hybrid supercar land. After that, look for more turbo engines and a new baby crossover in the lineup. ILX: A healthy re-engineering for 2016 saw the addition of a dual-clutch automatic transmission and a 2.4-liter four-cylinder engine to this Honda Civic-based sedan. A redesign will arrive in 2017 as a 2018 model, at which point Honda's 2.0-liter turbo four-cylinder could join the mix as an optional engine. TLX: New for 2015 with either a V-6 or a four-cylinder engine, the TLX will be re-engineered in the summer of 2017. 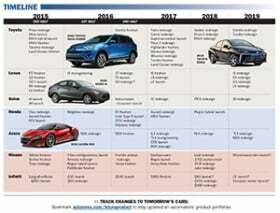 At that point, the 2.0-liter turbocharged four could join the mix. In 2019 the car gets redesigned, and the V-6 may not survive the transition. RLX: A redesign is expected in 2018 as a 2019 model. Philosophically, the car won't change much from what it is now: Front-wheel drive and a V-6 carry over, as does a higher-trim hybrid variant. CDX: This all-new model is due in 2017 as a 2018 model. It is based on the subcompact Honda HR-V crossover (itself based on the Fit hatchback) and will slot below the RDX in Acura's lineup. Look for it to carry a 1.5-liter turbocharged four-cylinder engine, optional all-wheel drive and similarly clever interior packaging. RDX: Freshened for the 2016 model year. Look for a redesign in the summer of 2017 as a 2018 model. Since Honda has traditionally offered only a single engine in the RDX, the current V-6 will likely be replaced with a 2.0-liter turbo four-cylinder, similar to many of the RDX's competitors. MDX: A freshened MDX will debut in 2016 before the crossover is redesigned in 2019 as a 2020 model. The 2.0-liter turbocharged four-cylinder may join the MDX family at that point, but don't expect it to replace the 3.5-liter V-6. NSX: The second generation of the NSX promises at least 550 hp from a twin-turbocharged 3.5-liter V-6 paired with electric motors and a nine-speed dual-clutch transmission. Expect low production numbers and a starting price in the $150,000 range.